No wonder, it’s just similar to any other hello-world program. When executed, it just shows pop-up message on the screen (see screenshot on the top). Anyway, it’s a good example of QPython program. Ok, next we’re creating an object droid (actually a class), it is necessary to call RPC functions in order to communicate with Android. 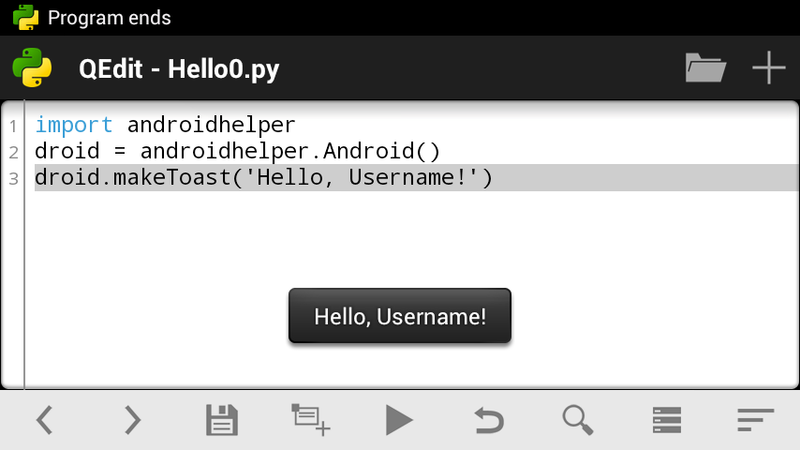 And the last line of our code calls such function, droid.makeToast() , which shows a small pop-up message (a “toast”) on the screen. Well, let’s add some more functionality. Let it ask the user name and greet them. Oops! Nothing printed? Don’t worry. Just pull notification bar and you will see “QPython Program Output: hello1.py” — tap it! As you can see, droid.dialogGetInput() returns a JSON object with three fields. We need only one — result which contains an actual input from user. Last two lines (1) format the message and (2) show the message to the user in the toast. See Python docs if you still don’t know what % means. Now I’m going to add a bit of logic there. Think: what happen if the user clicks Cancel button, or clicks Ok leaving the input field blank? You can play with the program checking what contains respond variable in every case. message = "Hey! And you're not very polite, %Username%!" Use < and > buttons on the toolbar to indent/unindent lines in if-statement (or just use space/backspace keys). You can read more about indentation in Python here; if-statement described here. First of all, we put user input to the variable name . Then we check does name contain anything? In case the user left the line blank and clicked Ok, the return value is empty string ‘’ . In case of Cancel button pressed, the return value is None . Both are treated as false in if-statement. So, only if name contans anything meaninful, then-statement is executed and greeting “Hello, …!” shown. In case of empty input the user will see “Hey! And you’re not very polite, %Username%!” message. Built with Sphinx using a theme provid by QPython. © Copyright 2017, QPython.